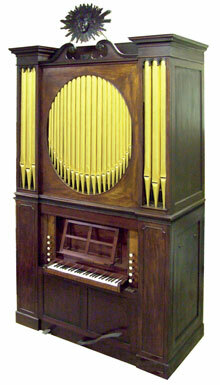 This Organ is the oldest organ in Australasia where the makers name can be readily established. The façade of the organ has the original inlay "Johannes Avery Londini fecit 1779". Avery was born in 1755 and died in 1808. He had a reputation for being a shocking, drunken character and often ... in prison for debt.But he was a well known organ builder of the time responsible for important organs eg in Kings College Cambridge and Winchester and Carlisle Cathedrals. Only 10 organs have survived and this is the largest example. It is a chamber organ probably built for use in a house (hence it can be closed to appear like a piece of period furniture) as a solo instrument or to accompany small ensembles in the music of Handel and his contemporaries. Little is known of its early history – it may have been in a West Country home in the UK. In 1859 arrangements were made by Bishop Selwyn to bring it to NZ for the St Paul's Anglican Church on Britomart Hill. When this church was demolished in the 1890s the organ was dismantled and spent some time in a tailors shop in Queen St before it was bought by Ponsonby Baptist church in 1898 for 98 pounds. Before it left England it was considerably altered and further alterations occurred on 3 occasions in NZ the most recent by Ralph Sewell. It has now been fully restored to its 1779 specification. This work was done in the Nottinghamshire Workshop of Martin Goetze and Dominic Gwynn. Edward Bennet was the principal builder and the consultant was John Maidment from Melbourne. The Mixture of Cornet, Sesquialtera and Dulciana has been rebuilt and an exciting finding was evidence of a solo oboe stop ("Hautboy") which has also been rebuilt including a small swell box. The organ has an electric blower but the original pedal and hand pumps action have also been restored. The result is a fascinating instrument both in appearance and sound. In the words of the consultantthis instrument offers unrivaled tonal resources in Australasia for the performance of 18th century repertoire.